Driving a car is necessary to everyday life, and, as a result, motor vehicle violations are everyday occurrences. Instances of violations include disobeying traffic laws, speeding, driving without insurance, reckless driving, and warrants for unpaid traffic tickets. Motor vehicle violations can be costly and can seriously affect a person’s life. New Jersey uses a point system to determine the severity of violations. Points are assigned after each conviction, affecting insurance and the driver’s record. A high point accumulation, over 12, can result in a license suspension. 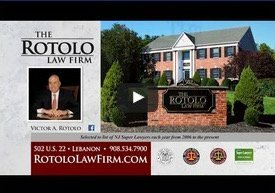 Victor Rotolo, Steven Karch, and the attorneys at Rotolo Karch Law have the experience to challenge a ticket in court. If you or a loved one has been charged with a motor vehicle violation, no matter how minor, Rotolo Karch Law has attorneys to represent you in court.